When laying pipes, to attain its full potential as a load bearing structure, trench width, proper bedding and backfilling are equally as important as the actual pipe strength. In fact, almost 50% of the completed structure is attributed to proper design and good workmanship. 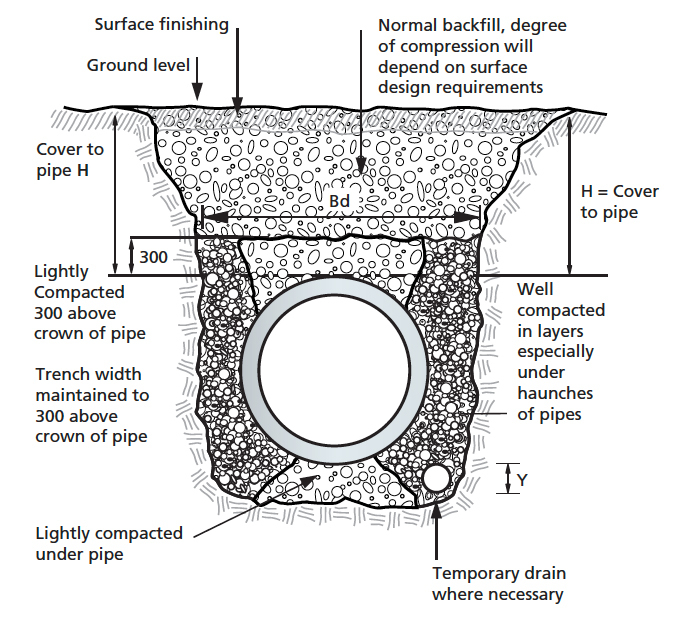 Any increase in trench width above that specified will increase the load on the pipe and a narrower trench may impede the proper placing and consolidation of bedding. The trench should be dug so that the line, gradient and dimensions are as specifications or as agreed with site engineer. The bedding is intended to level out any irregularities in the formation and ensure uniform support along the barrell of pipe. The selections of bedding material and bedding class is influenced by many factors which include the nature of the ground, the loads acting on pipeline, availability of a particular type of bedding material. The ideal is crushed rock or gravel that is compatible and provides stable embedment. For more details on bedding and pipe specifications see C.P.A. (Concrete Pipe Association) publications. It is recommended that were pipes have to be airtested, it should be done every fourth pipe and prior to back filling. Cover to pipes (H) laid in fields for agricultural purposes only = 600mm. However, it is advisable that pipes laid under roads carrying traffic or grass verges adjacent to such roads, should have a minimum 1200mm cover. Never drive across a pipeline with minimum cover unless at prepared crossings. Ground water should be kept below the bottom of trench by use of temporary drains and not allowed to rise before backfilling is complete. 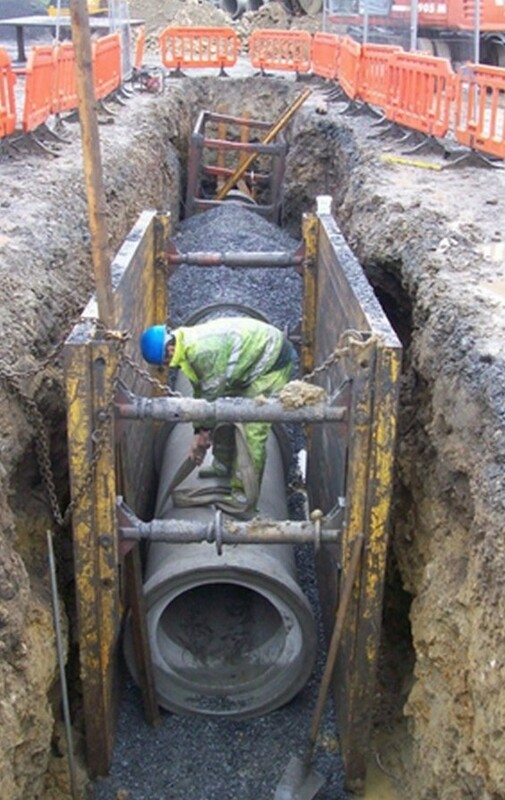 Special care should be taken with the bedding material immediately surrounding the pipes to minimise the possibility of lumps or others coming into direct contact with pipes thus causing point loading. Never bulldose backfill directly into trench.